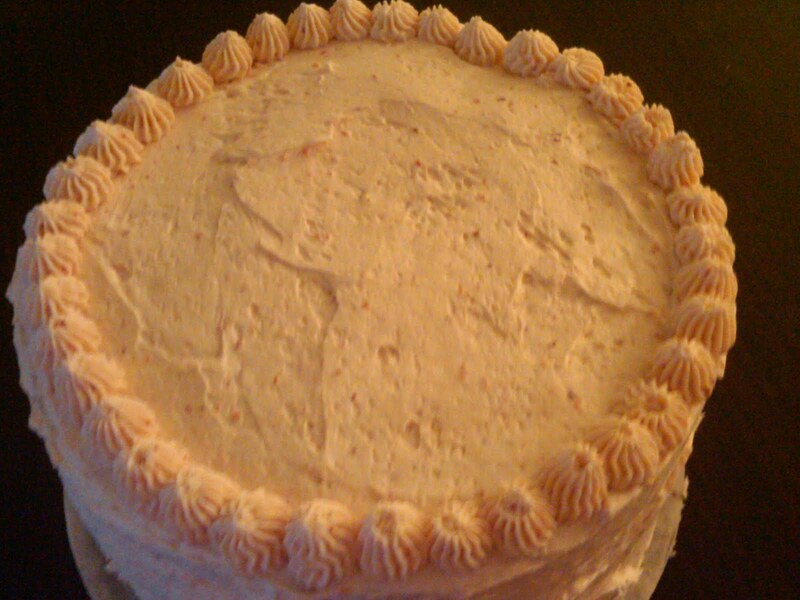 Kelly's Konfections: Issues + Whipped Strawberry Frosting! Issues + Whipped Strawberry Frosting! Today is a day I come to terms with some of my recent struggles and failures. On the technology front, Google Chrome isn't letting me post anything new, so I had to switch to Firefox (*grumble grumble*). That's not my fault, but still, my ego is a little fragile, so it hurts a little. My first week of classes has come and gone, and I have survived thus far! I'm finally done with all my general education requirements, so from now til I graduate, I can focus exclusively on my major (journalism) & my two minors (sport communication and spanish). Yay! Before I get into all that, however, I MUST share with you an utterly mind-bogglingly delicious frosting, created by Rosie of Sweetapolita. Last Saturday was my friend Candise's birthday, and to celebrate, my mom (who stayed with me last weekend to help me settle in- love her!) and I broke in my new kitchen and made dinner & dessert for her, and two of my other good friends :) I also used one of Rosie's recipes to make the vanilla butter cake, but I wasn't super crazy about it, to be honest. Mine turned out a little dry, and as far as I can tell, I did everything right. So, the quest for the perfect vanilla cake continues! Second sidenote: for the next month I will be focusing on vanilla recipes- I'm being treated for migraines, and I cannot have chocolate for another month- it's been a very difficult "journey" that started August 4 and will continue til October 4. As I have been forbidden to eat one of my favorite things, I have been trying to find almost-as-good alternatives. Anyways, to the frosting recipe! There should be some better pictures coming in, but these are the ones I have so far. 1. Whip butter in electric mixer (with paddle attachment) for 8 minutes on medium speed. 2. Add powdered sugar (slowly! ), milk, vanilla extract, and salt. Mix on low speed for one minute (mixture should be fluffy, light, and creamy). 3. Add strawberry puree, and mix until incorporated. 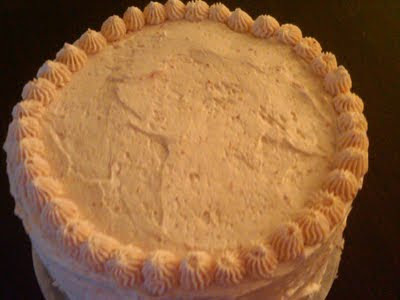 Note: The puree will make the frosting a nice shade of pink, but if you want to make intensify the color, I suggest using Americolor Soft Pink Gel Paste.